Bantamweight boxer Sam Larkin is ready to put a disappointing 2018 behind him with a new date scheduled for his long-awaited professional bow. 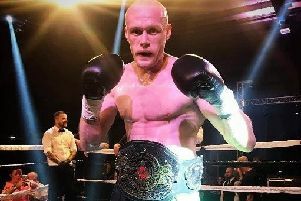 While the 28-year-old may yet appear on one of the scheduled York Hall bills in Bethnal Green next month, the former Sandygate ABC star has been pencilled in on the Kieran Farrell BEM promoted ‘Risk vs Reward’ card at Bolton Whites Hotel on March 2nd. The Alex Matvienko-trained fighter had no luck at all when attempting to get his career up and running, with three contests falling by the wayside, but after signing terms with Chris Jenkinson he’s starting to feel a lot more optimistic. “After all the troubles I had last year I’ve signed with Chris Jenkinson,” he said. “I’m 28 now, I don’t have too much time left, and I was contemplating going on the road as a journeyman. I was persuaded not to and now Chris has pulled a few strings for me. I’m in good hands. Highly-touted Yorkshireman Ismail Khan, a former sparring partner of Osman Aslam, had been offered as a potential opponent for Larkin’s debut but, with his coaching team erring more on the cautious side, the invitation was rebuffed. However, Larkin isn’t prepared to let any more opportunities get away from him as he bids to get the crucial fight details set in stone. “I want to take risks,” he said. “We’re still looking for an opponent but I’m willing to take anything, whether it’s a journeyman or an unbeaten prospect. I want to get noticed. If I went away and beat a prospect, or even if I impressed in battle, it would catapult me up the rankings. Standard tickets for the show are priced at £35, table seats with a waiter/waitress are £60 while a table of 10 can be purchased for £300. Anybody wanting tickets can contact Sam via Facebook. Sam would also like to thank PKB Building Services, The Asphalt Works Ltd, Dan Wolf at Viviere Liberare, JOG Building Services, Intershape Fitness, Unique Clean, Norpol Recycling, Steptoe’s Demolition, Mick Hughes Sports Massage, Shokwaves Barbers, Lean Clean Kitchen and DWE Building and Landscaping.